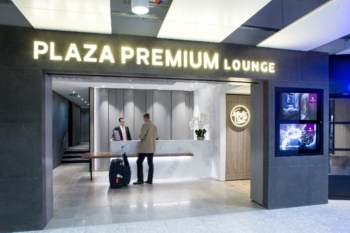 Plaza Premium has unveiled its new Arrivals Lounge in the landside area of Heathrow Terminal 4. Regular Head for Points readers will know that I rate Plaza Premium highly. They invest a lot of money into their facilities, especially in design, and they have a genuinely high end feel. and liked them all. The Terminal 2 arrivals lounge is pretty small – although it does have shower facilities – but the two departure lounges are very spacious. There is also a Terminal 5 departure lounge on the way for the end of 2017 which will hopefully be better than the Aspire lounge. A Terminal 3 arrivals lounge is also in the works. 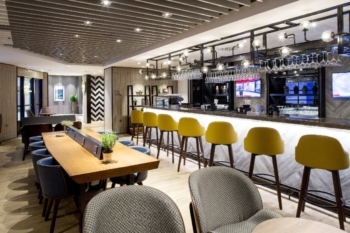 The new Terminal 4 lounge – on the mezzanine level in the arrivals hall – has 25 shower rooms, a lounge and bar area and a new-style dining concept, Flight Club, based around healthy eating. Capacity is 75 people which means it should be bigger than the Terminal 2 arrivals lounge, albeit only 40% of the size of the upcoming Terminal 5 departure lounge. It is not yet listed on the Priority Pass (for Amex Platinum cardholders) or Lounge Club (for Amex Gold cardholders) websites. As the Terminal 2 arrivals lounge is part of both schemes, I imagine that it will be added very shortly. You can book access for cash via the Plaza Premium website here. OT just booked my daughter an economy flight on American Airlines from CAE (Columbia , SC ) to DCM (Des Moines, Iowa) I understand that checked bags cost $25 for the first and $35 for the second, will this cover the entire (one way ) trip or will she have to pay for each flight separately? I have looked on their website but can’t seem to figure it out. Later today I need to book her from Chicago to Barbados and expect to face a similar issue. Zoe, the bag fee will cover the entire one way itinerary if connecting flights are involved (provided it’s all booked on one ticket as one trip). If your daughter has any form of Oneworld status then she’ll be entitled to at least one free checked bag on all AA flights. Be aware that the 2nd bag fee is up to $55 for Caribbean flights (depending on travel date). Thanks very much Michael. I will ask her to seriously think about how much stuff she could throw away before she heads home. any news on the Plaza Premium lounge in T5? Was due to open late 2016/early 2017? Last word was September 2017. It is apparently going in the same relative spot as the Aspire lounge but at the other end of the terminal. Wouldn’t you need a boarding pass to be airside anyway? The first line of the article says airside! Rob is not god and does occasionally make mistakes – whatever the article says, in this case the lounge is definitely landside. It’s where the Windsor Castle Spoons used to be (the cheapest pub on the airport! Which probably explains why HAL closed it down). To get there turn left when emerging through arrivals into the concourse, and there’s an escalator opposite WHSmith-it’s at the top. The Yotel is there too, and it’s just above the HEx platform for train access (the opposite side of the terminal from the tube, although it’s tiny so it’s not exactly far to walk). First para corrected to say landside! I used the T2 lounge twice last week – the first time I was asked for my passport OR boarding pass; the second time just where I had flown in from. On both occasions I had luggage with me so perhaps they just employ a ‘beyond reasonable doubt’ policy before asking for a boarding pass. I was thinking it’s a bit much to ask for a boarding pass – I can’t be the only person who has sometimes parted with it by the end of the journey. Any idea of the opening date for the T3 arrivals lounge? Any idea of the opening times? I always seem to end up on BA transatlantic flights that arrive after 2pm, which means I can’t use their (or the AA) arrival lounge. Closes at 10pm – so will cater for those arriving after the BA or *A lounges close at lunchtime. Slightly OT – does anybody know if it is possible to view one’s Lounge Club history? I can’t remember if I’ve used my two free visits or not, since I sometimes use my Diner’s Club card to access lounges. Thanks! OT but I was pleasantly surprised with the Plaza Premium offering at HKG on Sat night when flying Virgin UC. They have created a separate lounge for Virgin passengers with a decent drinks and food selection. The cabin was pretty full but there was plenty of seating in the lounge beforehand. They also have shower facilities available, a short walk away in another PP facility. I was sad the clubhouse closed before my long awaited reward booking, but the alternative was better than I had expected. Sounds like you went to the PP lounge in the centre of HKG. The one by Gate 40 (or nearby) has views over the runways and is very relaxed. Great food. They have a separate area for certain airlines, but the general access areas have a better view imho. When flying to oz, I look to see what prices Cathay are because I prefer transiting there than Dubai because of the PP lounge. Sorry OT: I’m looking to use my annual 241 Intercontinental Ambassador voucher at the intercontinental O2. I don’t believe breakfast is included in the AMB rate (£310 on the nights I’m looking at) but an upgraded room with lounge access is available for £375. No I think you’ve set that out correctly. I don’t know how much breakfast is though. Thanks Leo, having thought this through, I suppose I could actually technically book the room level below the club level room, given the guaranteed upgrade that comes with ambassador status. Thought club lounge access isn’t guaranteed even if you are upgraded to a club room? No longer the case I’m afraid. You either pay for the “Club Intercontinental Experience” in your room rate or in some hotels you can pay an extra fee. Automatic upgrading to a club room via Ambassador does not get you access to the club. Thanks everyone!! The collective knowledge of HFP readers never ceases to amaze me!! In that case I’ll pay for the club level room. There aren’t any strings attached if I use the amb voucher and do this are there? I.e I’ll get lounge access on both days. You could – but doesn’t IHG have a policy that upgrades to Club rooms don’t have lounge access?? If you pay for longe access you can have breakfast in the restaurant even if your room rate doesn’t include it. At least you could last September. OT vaguely recall seeing news that Amex was planning a centurion lounge at LHR. Has there been any updates as to when this would happen!? Never heard anything about this. Seems a bit of a remote idea given the 4 terminals. Normally I wouldn’t trust their dates with a large stick but, as May is next week, hopefully we can trust them on this!